Normal retirement age (NRA) is the age at which “full” Social Security retirement benefits – 100% of an individual’s Primary Insurance Amount (PIA) 1 – are available. For many years, NRA was set at age 65. Beginning with individuals born in 1938, NRA gradually increases until it reaches age 67 for those born in 1960 or later. If an individual chooses to receive retirement benefits before his or her NRA, the benefit paid is reduced to reflect the fact that income will be paid over a longer period of time. Similarly, if an individual chooses to delay retirement benefits, the benefit is increased for each year of delay (up to age 70) beyond NRA. 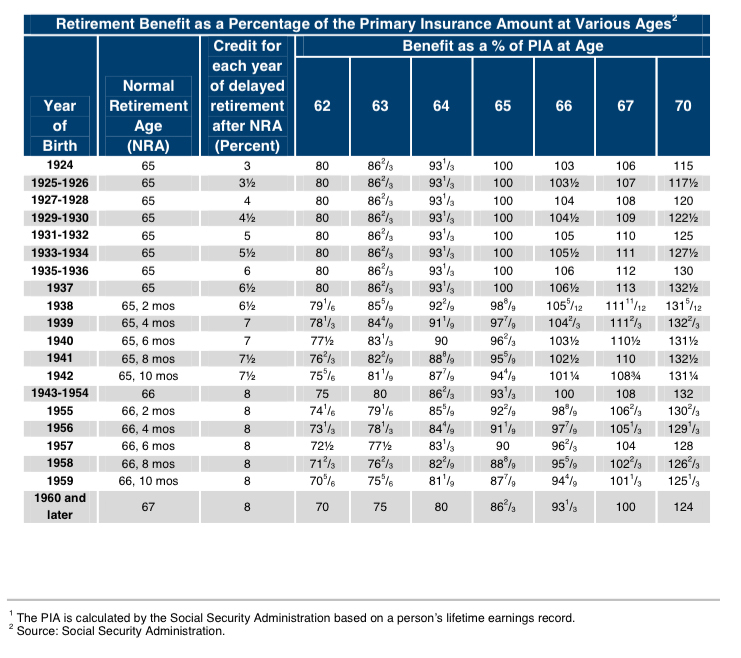 The table below shows the effect of early or delayed retirement on an individual’s retirement benefit, depending on the year of birth.